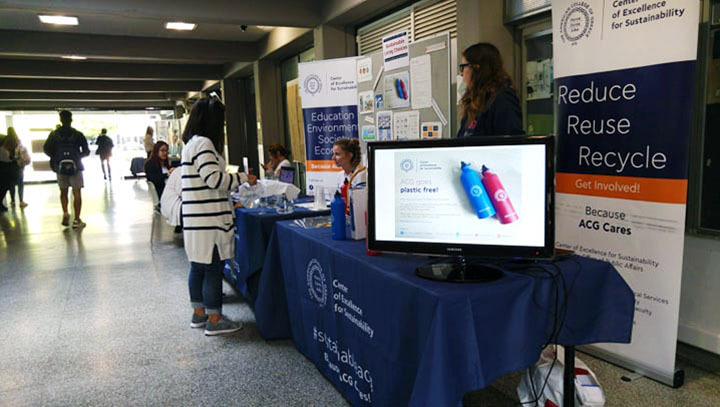 The American College of Greece | #ACGgoesplasticfree: Beating Plastic Pollution one water bottle/coffee cup at a time! Home » News & Events » News » #ACGgoesplasticfree: Beating Plastic Pollution one water bottle/coffee cup at a time! #ACGgoesplasticfree: Beating Plastic Pollution one water bottle/coffee cup at a time! Plastic lasts ‘forever’. Virtually all the plastic we have ever produced still exists in the environment in some form. For an item that lasts forever, it is ironic that more than 40% of plastic is used just once, then tossed away. Prime examples of this include single-use items, such as the plastic water bottle and the take-away coffee cup in which we regularly enjoy our morning coffee or tea. “[Plastic pollution] is a problem that goes beyond green. It is a problem of our society and it is a problem of our economy as well”, says Dr. Michael T. Valahas, Director of the Center of Excellence for Sustainability (CES). Recognizing the urgency of adopting a plastic-free lifestyle at a global level, we aim at raising awareness on the harmful consequences of single-use plastic pollution and guide you in making a successful shift towards eliminating single-use plastics from our campus. 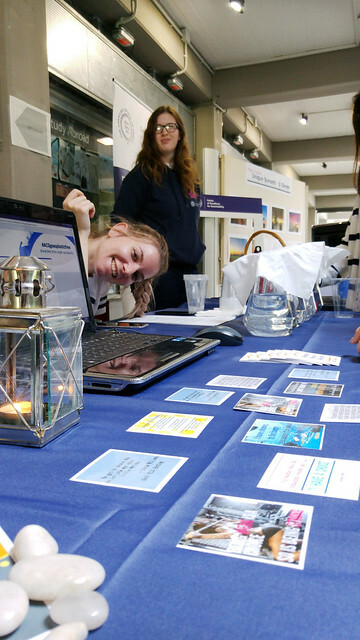 The official campaign kick-off event that took place during the Mind Body Spirit Fest 2018, from 9-13 October, included an interactive and captivating speech by the Director of the Center of Excellence for Sustainability at the Office of Public Affairs, Dr. Michael T. Valahas, and a weeklong display at the Main Corridor. Over forty ACG community members participated in a ‘Blind Water Tasting’ activity where they sampled water from various sources in order to “Find the Tap Water!” Participants learned more about why going plastic-free is now more important than ever, signed the Sustainability Pledge, and obtained the ACG-branded reusable water bottle to help minimize their plastic footprint both on and off campus. 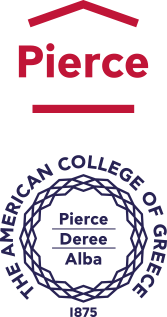 Going forward, we encourage you to bring your own reusable – the ACG one or other – water bottle that you can refill with quality water in the brand new top-notch ACG hydration stations, one at Deree and one Pierce. You can also bring your reusable cup when ordering coffee, tea or other beverages at any of the ACG vendors: Dipnosofistirio, Starbucks, Venetis, and Φbakery. Keep an eye out for the signs encouraging you to ‘Bring Your Own Cup’ placed at all locations in the near future. More actions will take place during the year towards eliminating use of plastic straws, cutlery and plates from our daily routines.